When visiting Amsterdam coffeeshops, which are local legal dispensaries for marijuana, there are few tips you should keep in mind. These dos and don't will help you when taking a trip to this city in the Netherlands, especially in the Red Light District where most of the 250 coffee shops are located. Coffeeshops should not be confused with coffee shops or cafes in Amsterdam, which are like American coffee shops that serve coffee and bakery goods. If you're looking to get high in Amsterdam, though, there are plenty of coffee shops in the city. To become even more educated about proper cannabis etiquette in Amsterdam, you can visit the Cannabis College, which offers information on using marijuana lawfully in the Netherlands. 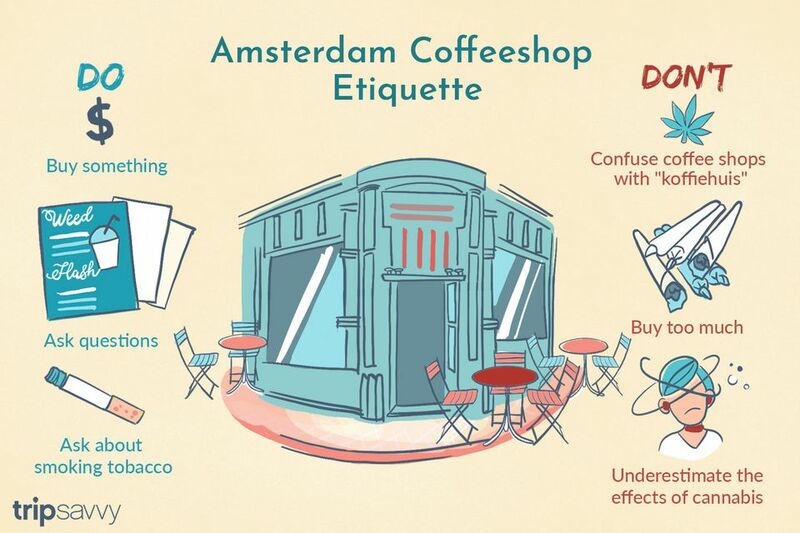 DON'T: Confuse "Coffeeshop" with "Koffiehuis" or "Cafe"
First-time visitors to Amsterdam or its coffeeshops may be confused by the terms used for different establishments. An important thing to remember is that a licensed seller of cannabis products is always referred to as a coffeeshop. Furthermore, a koffiehuis (coffee house) differs from a café, which is a casual restaurant or bar. If you're still confused, just look for a green and white sticker in the window, a license which designates the establishment as a coffeeshop. Visitors should also be aware that coffee shops do not sell alcohol. Since 2007, Dutch laws have dictated that a shop may sell either alcohol or cannabis products but never both. Every coffee shop has a menu, either on tables, behind the bar, or in a manned stall usually in a corner. Selections are typically divided into weed, hash, pre-rolled joints, and sometimes "spacecakes," which are sweet cakes baked with marijuana in them. Prices vary by quantity (grams, bags, individual joints) and quality. It's best not to just point to a funny-sounding name like "White Widow" or "Bubblegum" and hope for the best. Ask the staff what they recommend and what effects each type has. If you're intimidated, don't be—coffeeshop employees are friendly, knowledgeable, and very accustomed to tourists who don't know exactly how to go about the whole process. One of the biggest mistakes coffeeshop visitors make is buying too much of whatever they've chosen. A little goes a long way, and you can always come back, so buy small quantities. If you're with a group of three, for example, you don't need to buy three bags and three joints. Cannabis is meant for sharing! These cannabis products are likely much more intense than others you've tried, and if you've never tried them before, you should certainly start off slowly. People who over-buy end up wasting money and dumping leftovers in a trash can on the way to the airport. It's perfectly fine to visit a coffeeshop and smoke weed, hash, or a joint that you've already purchased somewhere else, which is another reason you shouldn't feel compelled to buy at every shop. However, it is considered rude not to at least buy a drink or snack if you bring in your own supplies. You'll want to anyway as coffeeshops are known for having some of the best coffee and fresh juices in the city. Don't forget to sample the delectable desserts or hapjes, which are little bites serving during happy hour. Even if you've tried cannabis products in the past, you should still be warned that selections in Amsterdam coffee shops are quite strong. If you're brand-new to it all, educate yourself by asking the staff about effects and just ease in slowly. Pre-rolled joints are often rolled with tobacco to cut the strength of the weed or hash. Pure weed joints are sometimes available but aren't meant for enjoying entirely by yourself in one sitting. Be especially cautious with eating spacecakes. Many people don't understand that the effects of cannabis when eaten are much stronger than when smoked. The results—which many people describe as more of a "trip"—can be overwhelming, especially if you don't know what you're in for. Not all coffeeshops in Amsterdam allow people to smoke tobacco, even when rolled into joints with marijuana. Smoking a cigarette indoors is pretty much forbidden across the city, though you might find some dive bars that still allow people to smoke inside. The best policy concerning tobacco is to be courteous to others when smoking around them—many marijuana smokers don't smoke tobacco as it's much more harmful to your lungs. When visiting a coffeeshop, make sure to ask the person working there where you can smoke tobacco. Unlike secondhand smoke from marijuana, tobacco smoke is harmful to others to inhale. Additionally, smoke from cigarettes tends to stain walls, furniture, and clothing when trapped indoors. Most people are generally fine with you smoking cigarettes outside, though. Amsterdam has hundreds of coffeeshops to choose from, each with its own unique vibe, atmosphere, and style. Some offer arcade and board games, some offer coffee and snacks, and some just offer a service desk where you can quickly buy a joint or edible marijuana treat. Coffeeshop Amsterdam IBIZA on Hemonystraat, 420 Cafe on Oudebrugsteeg, and Grey Area Coffeeshop on Oude Leliestraat are among the most popular of these cannabis stores. Coffeeshop Amsterdam is a trendy spot that was rated one of the top 10 coffeeshops in the world by World Travel Guide with arcade games, board games, and several large screen televisions streaming the latest fútbol matches. Before you order and light up a joint, make sure to ask the shopkeeper what forms of payment they accept. Many of the city's trendier spots don't accept cash, for instance, and some of them don't take credit. This is especially pertinent if you're a tourist visiting the city as you won't be able to draw out cash from a nearby ATM as you can in places in America like Colorado that allow for recreational use of marijuana. You will be refused service if you are unable to pay, but you can generally find a bank or currency exchange place to take out extra cash nearby. Most coffeeshops in the city only sell pre-rolled joints, hash, and edibles, so if you're looking for other paraphernalia for smoking like glass pipes or bongs, you're going to have to visit a specialty shop for that instead. Headshops and most souvenir shops across the city sell pipes, especially in the Red Light and Centrum Districts. However, keep in mind that if you use a pipe in Amsterdam, you will not be able to get it through customs in the United States as paraphernalia is still prohibited federally. While you can remain at a coffeeshop as long as you'd like, you are limited in how much you can buy from each establishment in a given day and how much product you can have on you legally. Amsterdam coffesshops limit purchases to five grams per day per shop, and you can only have up to 500 grams "stockpiled" on your person or at home. As a tourist, you won't likely need even nearly this much to enjoy a full day of being high.